Kofi Kingston is on clean-up duty after WWE allegedly messed up by running an ad that confirms he’ll be facing Daniel Bryan at WrestleMania. According to reports, an ad for the match was promoted to users on Instagram. Due to Twitter’s algorithm, however, it’s hard to verify if this actually happened. Regardless, Kofi saved the day with a clutch tweet. “Last week the gauntlet match was also advertised to kick off the show. It did not. Vince has been messing with us for a while now. 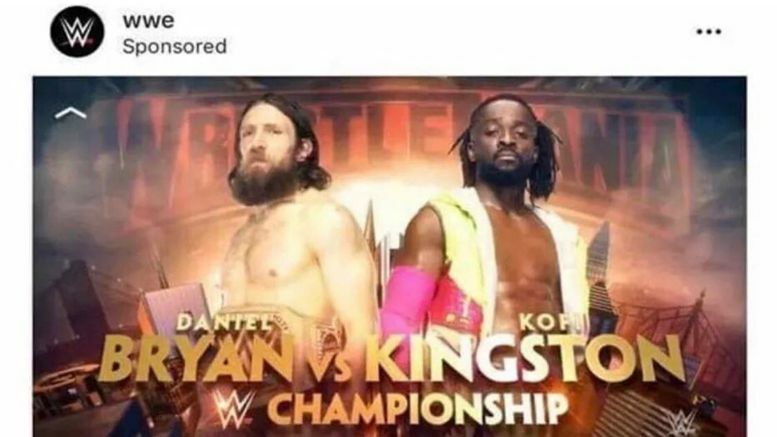 Wouldn’t be surprised if this was just more of the same,” Kofi said in response to a fan who shared a screenshot of the ad in question. Lets see if that changes tonight.